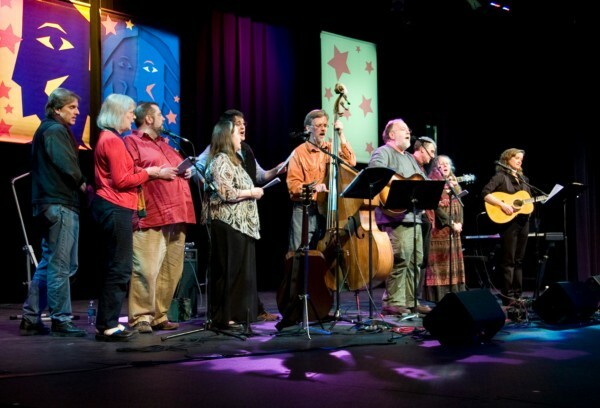 The Ten Pound Fiddle Coffeehouse and the City of East Lansing are proud to co-produce the Seventeenth Annual Mid-Winter Singing and Folk Festival to take place on Friday, February 1 and Saturday, February 2, 2019 at East Lansing's Hannah Community Center, 819 Abbot Road, East Lansing, MI. On Friday night, Joshua Davis, with special guests Jen Sygit and Laura Bates, will headline the festival. On Saturday night, a huge Community Sing will be lead by festival songleading favorites, Joel Mabus, Claudia Schmidt and Sally Rogers. Saturday afternoon from 112:20-4, the festival will offer 8 workshops related to community singing. Song sheets for each singing workshop will be given out by the presenter. No need to pre-register! Just come to the Community Center, purchase a $20 workshop wristband, pick workshops that interest you, pop into the rooms, and enjoy! (18 and under and all students are free to all workshops.) View workshop schedule here. On Saturday morning at 11 am, there will be a FREE Children's Concert, presented by Sally Rogers, and sponsored by the City of East Lansing. Kids of all ages are encouraged come to the Hannah Community Center and sing folk songs. Under this wider umbrella of programming, even more fans of acoustic music can enjoy a full weekend of singing and incredible performances. View complete schedule here. All events will be held at the Hannah Community Center in East Lansing, Michigan. Click here to get your tickets! Matt Watroba, current host of "Folk with Matt Watroba" on WKAR FM 90.5 and streamed on wkar.org will be the master of ceremonies on Friday night. Bob Blackman, former host of "The Folk Tradition" on WKAR FM 90.5 and frequent host of Ten Pound Fiddle concerts, will be master of ceremonies on Saturday night. Inspired by Pete and Toshi Seeger's highly popular Circle of Song tent at the Hudson River Clearwater Festival, this Singing and Folk Festival is designed for folk music lovers to be able to sing great songs with each other. Lyrics for the songs sung at the Saturday night Community Sing and afternoon singing workshops will be passed out. As the list of festival activities suggests, the songs themselves are the real stars of the Community Sing and singing workshops. Each singing event is designed to maximize audience participation. People who love folk songs are invited to bring family and friends and spend an evening, or the weekend singing great songs with song leaders who love this music. Did your family sing while doing the dishes? Do you sing on long car trips? This festival is for you. Even if your voice isn't as good as you want it to be, that doesn't matter. This weekend is for people who love to sing. This weekend will spread a little warmth on two chilly, winter days. Find schedule and ticket information, and food and lodging information and more here on this website. For those who do not have internet access, call 517-267-0410 and ask to be mailed an up-dated festival schedule.